Six Generations Home Page >>> Reviews >>> What is Six Generations? Six Generations is a modern deck of playing cards and historical images, created with a help of a science, called genealogy. Genealogy, combining the knowledge in history and genetic about our families and ancestors, helps us to answer many questions of the present and the past. This is one that kind of question. Why do all regular playing cards have King, Queen and Jack as the only costumed characters? The answer is: the modern playing cards have been created in Venice, Europe seven centuries ago during the monarchy, and no other family members could join the Royal family as an equal party. That's why other cards in the deck became the boring numbers, from two to ten. The evolution of society made all people equal. But we were playing the old monarchic cards, and didn't really have a choice to follow the history... until now. We are happy to introduce new, democratic deck of playing cards for all your gaming needs. This is real revolution in card games! And each card has a picture of a man or a woman in a colorful costume from the country and time they are from. 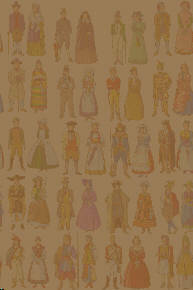 This pack consists of 72 cards representing people of six generations. There are couples from 20 countries of early 19th century Europe and five generations of American descendants (16, 8, 4, 2 and 2 cards) which can be laid out in various ways to form a family tree, the last generation of which is a brother and sister living at the start of the 21st century. With this new deck of cards, the game players and inventors may create hundreds new card games. This deck comes with the rules of the first genealogical, solitaire-type card game SIX GENERATIONS, based on new structural concept of Six Generations playing cards. 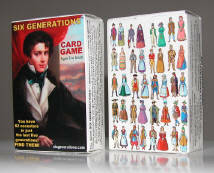 The rules of other card games are available at this web-site on the page GAMES and others. Please, read the rules and learn how to play, read the reviews about Six Generations playing cards, and check where to order them. And enjoy playing the card games with your friends, family and children! Posting by Fyodor Soloview, author of Six Generations Playing Cards. 2005.